The flight grounded to a halt, 50 minutes late at 22:17pm. HURRY UP! shouted a airport security guard. Me and a handful of others legged it through Casablanca airport, running in vain to catch our connecting flight to Marrakech at 22:35pm. We scrambled onto the plane in the nick of time, as waiting passengers looked at us in disdain. I stretched my legs across three empty chairs and sat in hope that my luggage made the transfer too. Upon landing, I smiled happily as I caught sight of my familiar green rucksack trailing along the conveyor belt. I met up with our guide, Yousef, and I boarded the transfer bus, meeting 7 others on the same tour as me. We arrived at ‘Moroccan House Hotel’ and we were greeted by the sight of a mosaic reception, inside balconies and a hanging, multi coloured lantern as the centerpiece. ‘Room 22’ – I told the lady already that you were coming later. I wondered who I’d meet, I was currently the youngest in the group by around a decade and I hoped I’d meet someone like-minded and of similar age to me. I was sharing a room with Abi (also 22! ), a medical student from Liverpool who I grew incredibly close to during the trip. After breakfast in a Moroccan tent on the rooftop of the hotel, we left our rooms and loaded a minibus with our rucksacks. 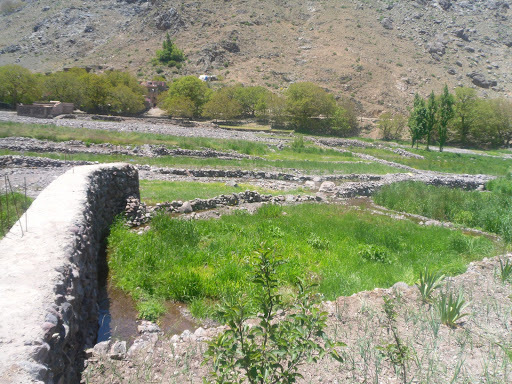 We drove straight to the mountainous village of Imlil, ready for our light 1 hour trek to ‘Gite d’etape’. 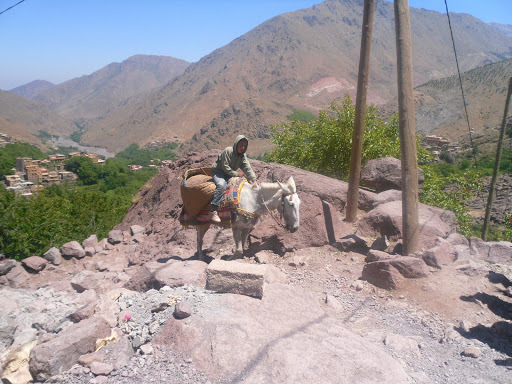 Our guide said in a nutshell “Marrakech 500M, Imlil 1700M and Gite d’etape 1960M“. The road weaved through beautiful mountainous terrain with glistening rivers, extensive hills and rolling greenery. We hiked up steep, rocky terrain to hostel-type accommodation with a kitchen, shared dormitories and a balcony with a view. 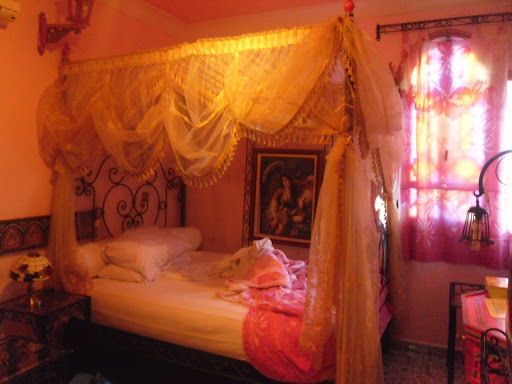 Upon arrival, we split into male-female rooms (17 of us in total: 9 girls and 8 guys). 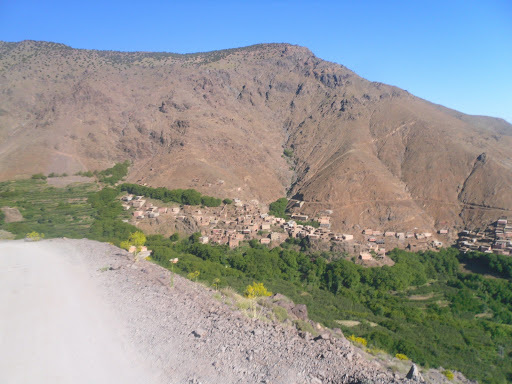 With the afternoon free, Abi and I decided to go for a wander around the Berber villages and the mountainous surroundings. We walked aimlessly, passing a wooded area where I said “that tree looks really climbable”. Normally, I’m so used to disapproving replies such as “don’t be stupid” or “No.” I found it so incredibly refreshing when Abi said “that’s what I was thinking” and proceeded to drop her backpack and start climbing the tree. It is in these moments where I realise how much I love to travel, meeting like-minded people and experiencing the world in sync with others who share your passion. We strolled through dusty villages and rocky paths, settling on a wall overlooking a large plain with a mountainous backdrop. We watched children cycling past and mules trudging with heavy loads. We strolled back to Gite d’etape in time for dinner and had a debrief for tomorrow’s acclimatisation hike. 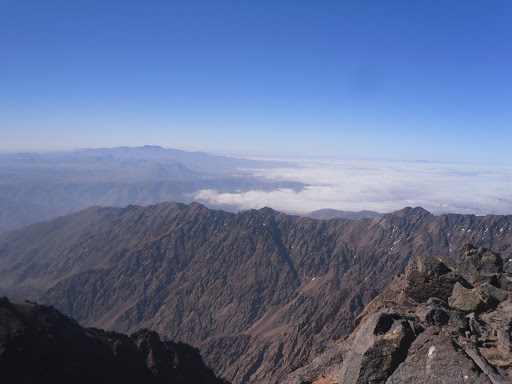 We would be hiking up from 1960M to 2489M on “Mount Tizi Mzik”. Dinner consisted of stir fried beef, seasoned vegetables and cous-cous, setting the standard for the lovely dinners we proceeded to have whilst on our hike. 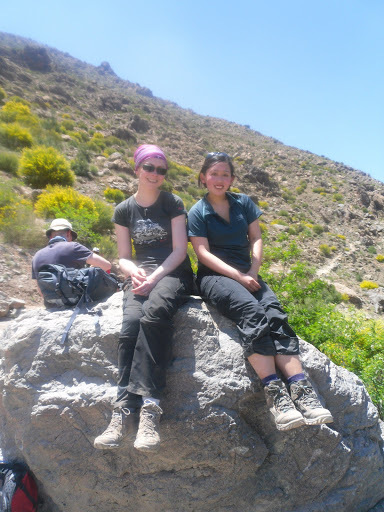 We spent the evening chatting to other trekkers and to our lovely co-guide, Wasin. Breakfast consisted of fresh Moroccan bread, tea and muesli. We set off on a straight forward dirt road, meandering through the mountains on a medium gradient. 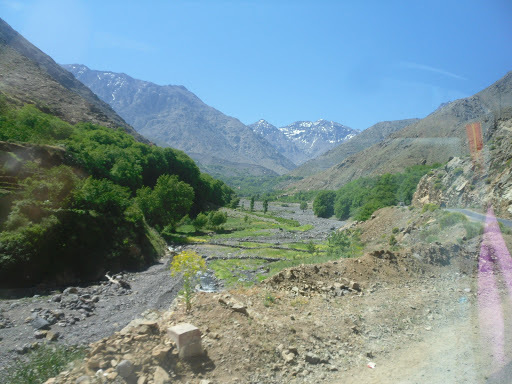 As we strayed off the road, the trek increased in difficulty with rougher terrain and steeper slopes. My breathing became increasingly ragged and shallow as we got higher and higher pass 2000M. Several hours into walking, I began to use coping mechanisms in order to keep up with the guide. I would count in order to remain in pace: 1…2…3…4…5…6…7…8 repeat. I would follow stride with the person in front so I could never fall behind. My back was drenched in sweat. By 2300M, the group had split into sections with Abi, I, and some of the guys at the front and the rest of the group up to 30M behind. At some points, I wanted desperately to stop, but I knew if I did it would only make it harder. We gradually emerged over the pass hours later, taking in the sight of snowy mountains. 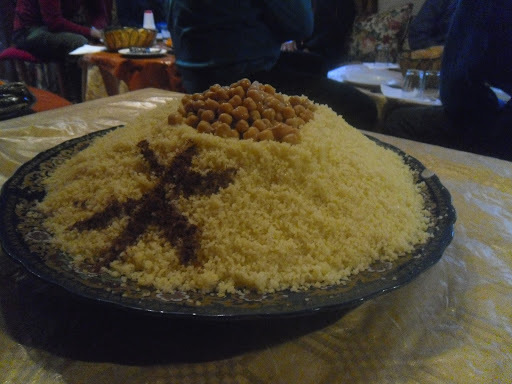 A small mound of rocks and a hut marked the top of mount Tizi Mzik. I felt a massive sense of elation and energy upon reaching the top. Our guide patted us on the shoulder gruffly, and said “brave girls” as we waited for the rest of the group to emerge. On the peak, we sat in the shade eating oranges purchased from a guy manning the hut. I felt revitalized and full of beans! We arrived back at Gite d’etape late afternoon: playing cards, having a debrief about tomorrow’s trek to basecamp and another lovely dinner (which I had no appetite for, probably due to altitude). It was Sarah and Gale’s birthday and the guide brought over coconut and chocolate cake for the occasion. 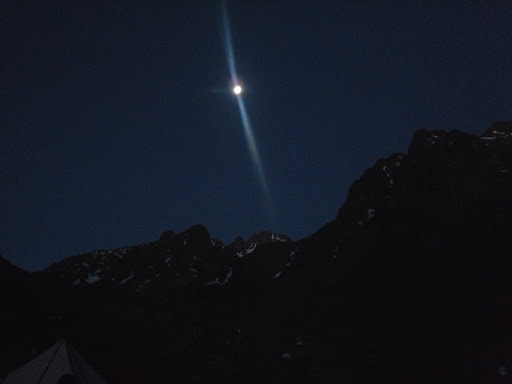 We packed and set off for 8:30am, for our next leg of our trek from 1940M (Gite d’etape) to 3207M (Neltner Basecamp). The path started off incredibly rocky and irregular with precariously thin ledges and long drops to the side. 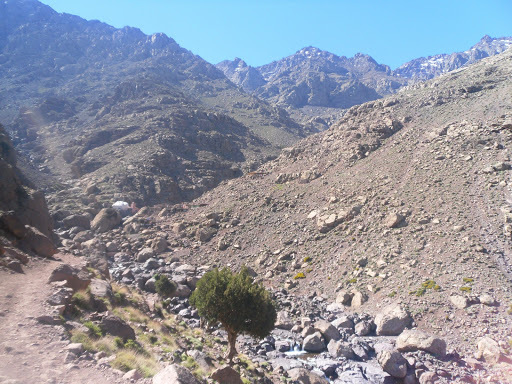 We trekked for a few hours up to Sidi Chamharouch, a shrine where a lot of Moroccans pilgrimage to. The path became very steep thereafter. I remember feeling sorry for Abi who was walking behind me as I am prone to stumbling/walking unpredictably. 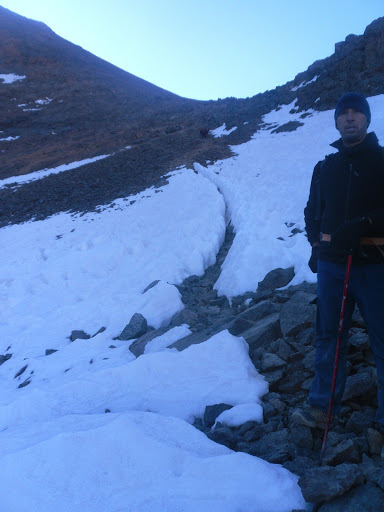 I really began to feel the altitude during this trek, my breathing became quick and shallow and my heart thudded rapidly. 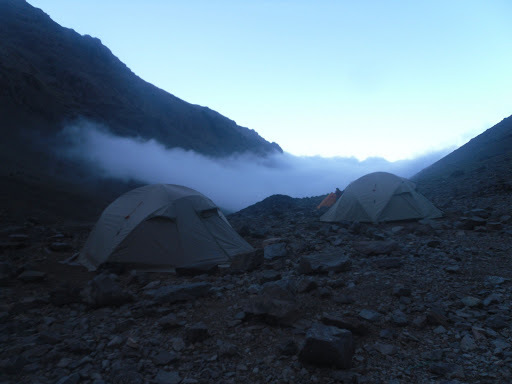 We arrived at Neltner base-camp around 5 – 6 hours later. 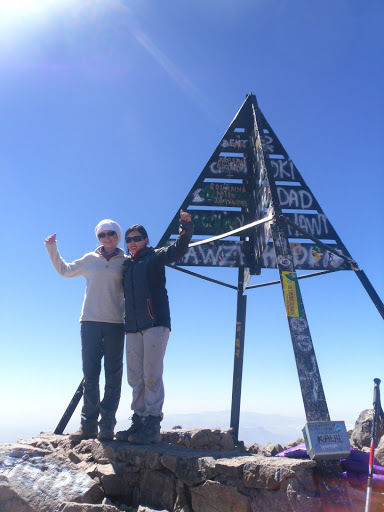 Day 5 – Summit Day! 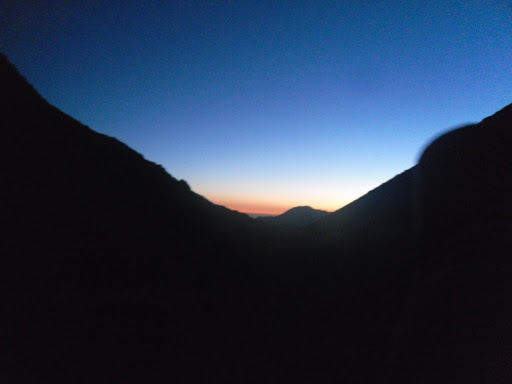 Ascent: We woke at 5:05am to a freezing cold morning, with a sunrise on one side and a bright moon on the other. The beginning of the trek was very very boulder-y. I used my hands a lot much to the guide’s amusement. We ascended slowly, walking to the light of dawn whilst enduring the freezing cold temperatures. A few hours in, Sarah pressed for details, asking the guide how long/how far we were from the top. I didn’t want to know. Not knowing was another defence mechanism for me. All I wanted to do was take it one step at a time. Much to my relief, the guide gave a very vague answer, only telling us to continue instead of quantifying the distance. Several hours in, we passed a icy wall and scrambled up a rocky ledge up to 4,000m! Only 167M to go. We traversed upwards. Slipping and sliding on the minute-sized scree. Hopkin described the terrain as “walking on marbles“. We bumped into x2 Belgium hikers for the third time. Our guide tells them in French that their country does good chocolate. They chuckle good naturedly and throw us a bag of M&M’s to share, wishing us luck on our final stretch towards the summit. I don’t look up. I don’t want to know how close or far it is. Knowing so would only either make me more careless or dampen my spirit. 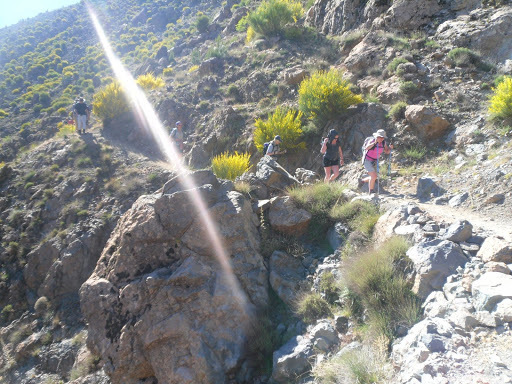 We emerge over the last climb at 4,167M. Our group cheer joyfully, congratulating each other and exchanging hugs. We spend 30 minutes on the summit: taking photos, enjoying the view and savoring the experience. 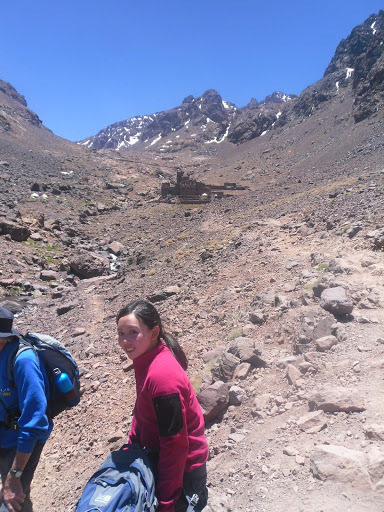 28th May 2013 – Mount Toubkal Summit Day! Descent: We begin clambering down one by one. Within five minutes, I’d slipped and fallen: the scree was very difficult to grip on. I keep my gloves on: they acted as saving grace for my hand skin. I tried to pay utmost attention to where to place my feet, yet I still fell more times then I care to remember. Hopkin warned us to be careful and that “more accidents happen on the way down because people are tired and more reckless”. I slipped and slid clumsily during the descent, drained and annoyed at myself for my poor technique. 4.5 hours later, we arrived back at Neltner in a state of exhaustion. We all retire quietly to our tents after having lunch. Abi and I venture over to the refuge for a well-needed shower, getting lost in the dark then crawling back to our sleeping bags for sleep through the afternoon to night. Physical/Fitness wise: I thought the trip was hard but manageable. 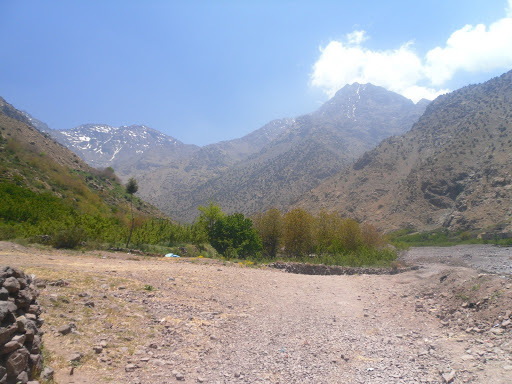 Mount Toubkal is a non technical climb and with the right mindset and will-power I think it is a achievable feat for most people. Don’t underestimate little things like bringing walking socks. I was really grateful for mine throughout the duration of the trip. 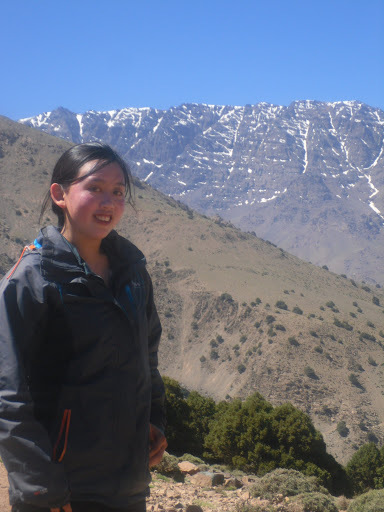 I was lucky not to have experienced AMS (acute mountain sickness) during the trek. Bring paracetamol just in case! I brought a lot of snacks such as cereal bars/chocolate that I didn’t eat in the end due to lack of appetite. Fruit was a god-save during the hike (sugary and hydrating). It was COLD in the morning! (May 2013). Bring lots of layers. Hats and gloves really do the trick. 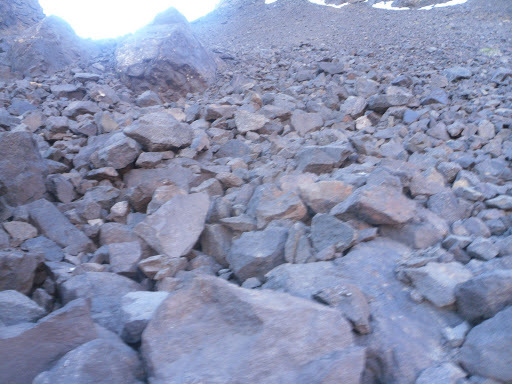 The toilet at base camp consisted of a hole and rocks. Brace yourself :).